So much of how I decorate has to do with easily changing out my accessories for the different holiday seasons. Changing out your pillows or pillow covers can be the quickest way to do this with a huge amount of impact. Lets talk about Halloween. There are so many Halloween pillows out on the market these days its sometimes can seem hard to choose the right ones for your homes decor. 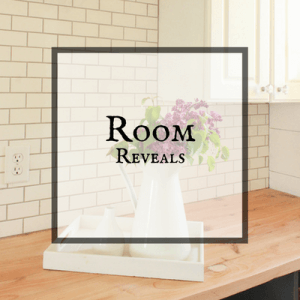 I find that if I can incorporate pillows that blend into the rest of the decor, you are more likely to reuse them over the years, as you can find yourself growing tired of the more trendy products. 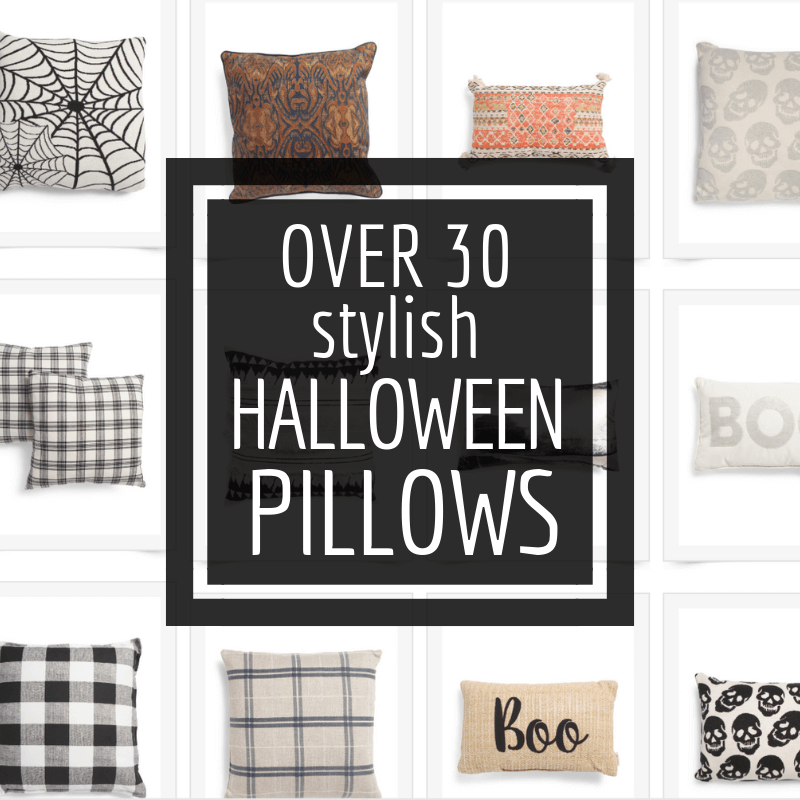 So, I wanted to round up a large collection of over 30 super stylish Halloween pillows that you need to get your hands on right now! If you saw my Halloween home tour a few days ago, you may have seen that I had added a few Halloween-ish style pillows to my living room. I like to add accessories that lend themselves to the season without being too obvious. You could say I want them to work for more than one season and be more flexible around my home as a dual purpose kind of item. I have a hard time wanting to spend 30 dollars on a pillow if its just for Halloween…but if I can use that dark grey plaid pillow for Halloween, possibly for Christmas and maybe even throughout the year in a bedroom or entryway depending on how I change my decor, then I find it a much more worthy purchase. I think of this every time a make a purchase like this. 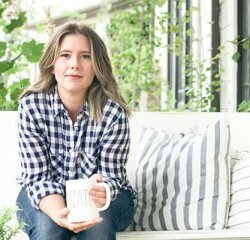 Pillows are so easily changed out, but lets get real, they can be pricey. So, why not get more use out of them, use them around your home, reinventing their purpose. I find this incredibly satisfying. Its generally called “shopping the home”. 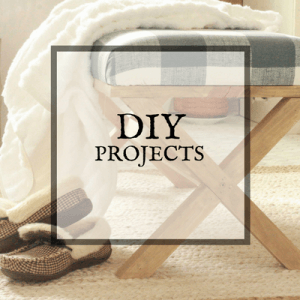 You never know where you may use a more neutral black plaid pillow. But, the chances of you using a pillow with a witch and a black cat on it throughout the year other than Halloween are pretty slim to none. 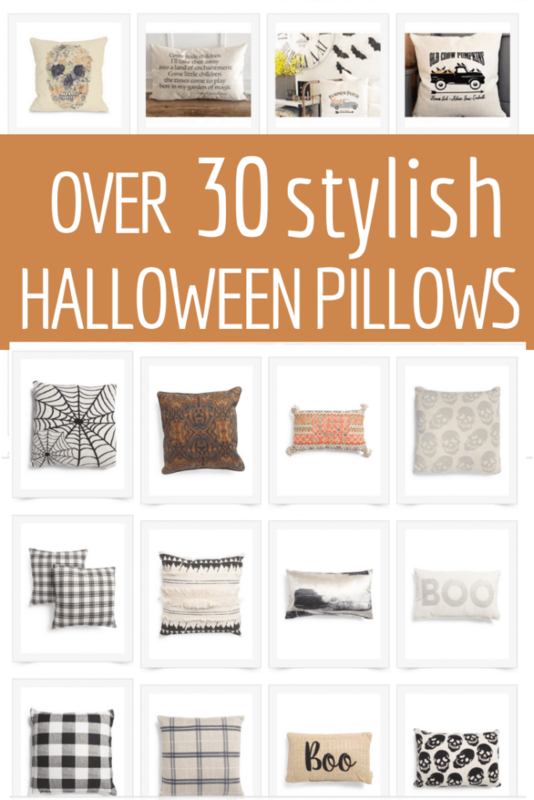 So, when I was curating this list, I wanted to find some fun Halloween pillows that were obvious “Halloween”, but I also wanted to pick some that lent themselves to be a great decor companion to your Halloween decor. Think about black or grey plaid, buffalo check, tribal, or simple orange or black pillows that have some fun texture. I wanted there to be a variety of Halloween pillows that you could peruse through. Simply click on the image to be taken directly to the source…. I am slightly obsessed with this collection. There are so many here that could transition from Halloween, into Christmas and keep on going, and yet, will always work with the season or decor type you choose. I think I may need to purchase a few more of these to use throughout my house. I’m in love! Which ones are your favorites? I can’t decide! Now, its time for me to get ready to go camping! We are heading out this weekend to do some camping before fall turns to winter and we are forced to wait until next year. I love camping, and I cannot wait to get out and spend some time with the family. Before you go…I wanted to make sure you saw my new Halloween printables! They are new newest obsession! 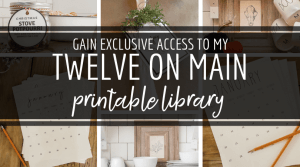 You can purchase the entire set right here! Make Your Own Witches Corn Husk Broom for Halloween! Make sure you share this with friend and family! I’m sure you know someone that would love to see them! « Make an Easy Bicycle Wheel Wreath in Only Minutes!